Heavy-duty Loop Hook is perfectly designed to neatly hold a variety of hardware, such as ladders, cords, and standard garden hoses, providing quick and easy access. Attractive graphite color with non-slip covering protects cords and hoses from kinks and damage. Universal tongue and groove design allows for simple Wallscape slatwall attachment. 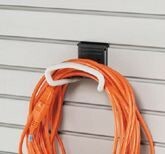 A must have slatwall accessory for a perfectly organized garage.